Brexit should be delayed if Parliament does not approve a deal in the coming days, three cabinet ministers have warned publicly for the first time. 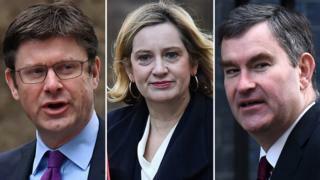 Ahead of crucial votes in the Commons, Greg Clark, Amber Rudd and David Gauke told the Daily Mail time was running out and that they hoped for a breakthrough in negotiations soon. If not, they said they are prepared to defy Theresa May and vote for a delay. Downing Street said the trio’s views on no deal were “scarcely a secret”. Number 10 said in a statement: “The PM is working hard to ensure we get a deal with the EU that allows us to deliver on the result of the referendum. Earlier, Mrs May’s spokeswoman said the PM would have another “period of engagement” on Brexit at an EU-League of Arab States summit in Sharm el-Sheikh, Egypt – including a meeting with European Council president Donald Tusk. The UK remains on course to leave the European Union on 29 March. But the government has repeatedly refused to rule out the possibility of the UK leaving without a formal deal, in the event that Mrs May cannot get MPs to approve the deal she negotiated with Brussels in time. MPs are due to debate Brexit again next Wednesday and are expected to consider an amendment tabled by former Tory minister Sir Oliver Letwin and Labour’s Yvette Cooper to give Parliament the opportunity to delay Brexit and prevent a no-deal situation if there is no agreement with the EU by the middle of March. Mr Clark, Ms Rudd and Mr Gauke argue if a deal is not endorsed by MPs imminently “it would be better to seek to extend Article 50 and delay our date of departure rather than crash out of the European Union on March 29”. Mr Clark, the business secretary, along with Ms Rudd, the work and pensions secretary, and the justice secretary, Mr Gauke, said there had been “months of uncertainty”. But they also warned Brexiteers in the European Research Group (ERG) that Parliament will block the UK leaving without a deal, stating that if there is a delay “they will have no-one to blame but themselves”. Their article comes after the BBC was told dozens of normally loyal Conservatives could back plans to stop the UK leaving the EU without a deal if a reworked version of Mrs May’s plan does not pass. Mark Francois, Tory MP and vice-chairman of the ERG, told the BBC that “the prime minister will want to know why three members of her cabinet have decided to publicly decry government policy” and added that he thought it was “interesting that the chancellor has not signed the letter”. Fellow ERG member and Tory Brexiteer Andrew Bridgen said the three should “resign immediately” if they didn’t support government policy. However Tory MP Nick Boles, who voted Remain but supports Mrs May’s deal, said they were “courageous and principled” for speaking out to try to avoid a no-deal Brexit. Meanwhile, Labour MPs Phil Wilson and Peter Kyle are planning to put forward an amendment that would allow Mrs May’s deal to pass in the Commons, as long as it is then put to the public in another vote. Mr Wilson told BBC Radio 4’s Today programme that his amendment had the support of shadow Brexit secretary Sir Keir Starmer and shadow chancellor John McDonnell, and he hoped to secure the backing of the rest of the Labour front bench. It is a pretty incredible intervention by these three cabinet ministers. Time and time again Theresa May has said the UK is leaving the EU on 29 March, in just five weeks’ time. It’s a very different message from these three. They’ve all made it very clear they wouldn’t accept a no deal scenario. Now publicly, for the first time, they’ve said Brexit would have to be delayed if Parliament doesn’t back a deal next week. In their article in the Daily Mail they’ve got a pretty stark warning to their colleagues. This is happening because, on Wednesday, there will be an attempt by MPs to seize control of that Brexit process. These three are suggesting that they will be prepared to resign in order to back that move. This is piling the pressure on Mrs May to get the changes to the deal, to bring it back early next week, but it’s also piling the pressure on their colleagues to get behind the deal. Don’t be in any doubt, what they are saying is not government policy.